In preparation for Baselworld 2016 and after the successful launch last year of the Angelus U10 Tourbillon Lumière —our hands-on review here— that brought the brand back from the ashes; Angelus presents now, the U20 Ultra-Skeleton Tourbillon. The entire U20 Ultra-Skeleton Tourbillon watch has been conceived as a beautiful mechanical haute horlogerie sculpture. Built like a supercar, its design is streamlined and based on structural optimization. Made of sapphire, carbon and titanium, the U20 is at the forefront of cutting-edge watchmaking. From the movement to the case design, every aspect of the U20 has been conceptualized to allow light to enter the watch and reveal the splendor of the movement’s architecture and tourbillon. The first elements one sees, are the raised dome sapphire crystal of the carbon case measuring 42 mm x 10.30 mm and the mirror-polished beveled edge of the monobloc titanium lugs, all reflecting the light. A deeper look reveals the virtually transparent movement floating in the case and allowing an unobstructed view through the watch. The movement is based on a sapphire main plate, with key components supported by beautifully hand finished, blue skeletonized satin-finished titanium bridges. The absence of a dial and the use of a sapphire crystal dome set directly onto the carbon fiber case allow full visual access to the movement from both the top and sides, accentuating the three-dimensionality of the movement’s architecture. The titanium lugs, which are securely attached to the carbon fiber case and reinforced with an armature of carbon fiber, have a very technical shape and echo the titanium bridges of the movement. However, the intricacy of the lugs is softened by the clever use of polished chamfered edges and contrasting satin-finished surfaces. The U20 Ultra-Skeleton even goes a step further. It does not boast an ordinary movement that has been skeletonized afterwards, but a tourbillon movement that has been created from scratch to be symmetrical, transparent and resplendent. To further enhance transparency, the U20 features a sapphire main plate. The bridges have been made of blued titanium and have been skeletonized to increase transparency even further. The bridges’ beam shape also maximizes rigidity —the latter being essential for chronometric precision. The discerning eye will be pleased to discover that haute horlogerie has not been sacrificed on the altar of transparency: components in the Ultra-Skeleton Tourbillon have been hand-chamfered, hand-polished and hand satin-finished to ensure that they look as good as they are filigree. 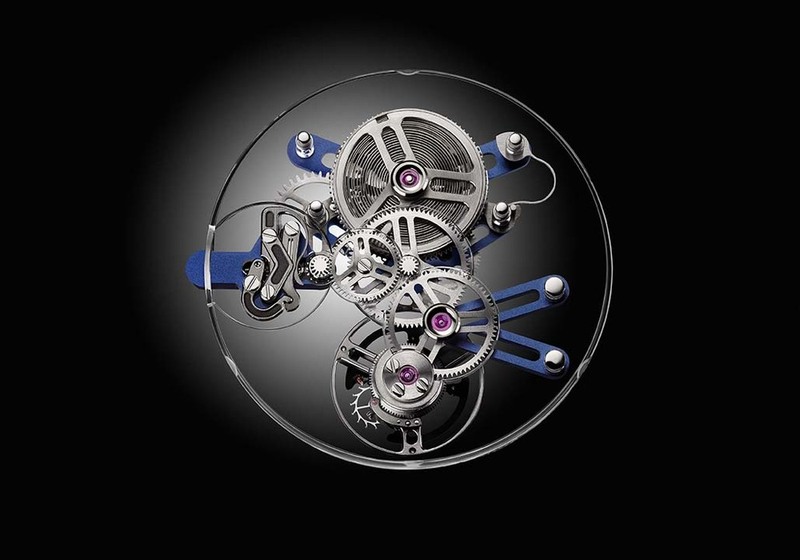 The U20 Ultra-Skeleton Tourbillon deserves closer inspection, which reveals many of the well-thought-out details that go into transforming a skeleton watch into an ultra-skeleton haute horlogerie watch: the variable inertia balance wheel of the tourbillon is especially designed and crafted to minimize air friction; the sapphire main plate is polished to the highest optical grade; ruby bearings are set into solid gold chatons. The ultra-light case, entirely made of carbon-fiber, titanium and sapphire, has been designed to echo the visual lightness and the technical feel of the timepiece. The tourbillon is “flying", which means that it does not require an upper supporting bridge. This helps to maximize the three-dimensionality of the movement and allows maximum appreciation of the technical and aesthetical refinements throughout the movement. The tourbillon’s steel cage is hand chamfered and polished with flat surfaces either mirror-polished or satin-finished. The variable inertia balance wheel is regulated by four gold weights around its perimeter. In the quest for high performance, the rim of the balance wheel has been milled to maximize aerodynamics and reduce air resistance. The highly engineered movement further features beam-type titanium bridges which are skeletonized to increase transparency even more. The titanium mainspring barrel bridge is supported by slim pillars set directly into the sapphire main plate to optimize visual lightness. All wheels throughout the entire gear train have a specially developed six-spoke design, again in the quest for maximum rigidity for minimum mass. All of the rubies, which actually act as low-friction bearings, are fitted into solid gold chatons that are embedded in the sapphire main plate. Gold chatons not only look good and attest to the movement's haute horlogerie bona fides, they are also non-magnetic and corrosion resistant like the sapphire itself. This new watch is yet another one that we can't wait to see in the metal as we report live straight from Baselworld 2016 next month. Our live Baselworld 2016 coverage will begin on March 16, 2016.